Honest, reliable & proud of our work. We pride ourselves on providing high building service levels as well as personal service to our clients from the beginning of a project right through to completion. We have been operating as qualified Master Builders in York since 1998 and continue to proudly display our Yorkshire Heritage. Our core beliefs centre around the quality of our work, creating outstanding buildings which are built to last, enhancing established properties and building new, functional spaces to suit your every need. 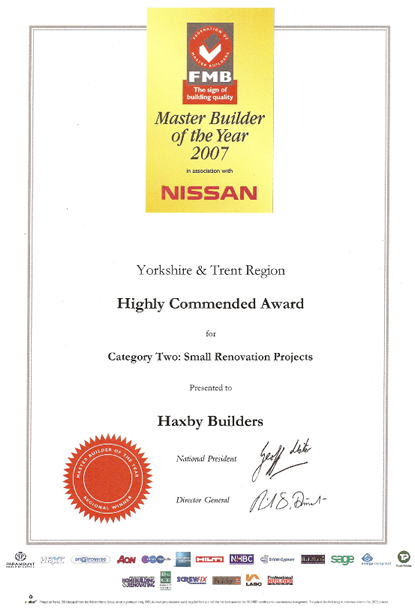 We take great pride in seeing our completed spaces enjoyed by our happy and extensive client base. Our pride and professionalism is the hallmark of our services and the cornerstone of our success – after all, your building is our reputation. Large or small, from initial idea to finishing touches, our own exacting standards and membership of the Federation of Master Builders means we adhere to a strict code of conduct within the building trade. This ensures you receive clear and transparent quoting, consistent, open communication and a quality of workmanship second to none.